Cornelius was born and raised in Hagerstown Maryland, where he attended Bowie High School. His parents are from Ghana. He moved on to play at Potomac State College where he captained the team to a NJCAA division I semi-final as well as attaining honors such as the Division I all-star team and leading the team in scoring during the 2000-01 season. He then continued his playing career at WVU where he played for one year. 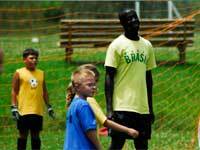 He has been with Valley Soccer academy for one year and is one of our youngest and most committed trainers. Cornelius hopes to continue his coaching career in efforts to become a highly respectable youth developmental coach in the region.